I was thinking since it's my birthday today - I might start something new. But what??? The next thing I was thinking of is "Quaker Diamonds." Check out Coni's beautiful finish if you haven't done so already!! 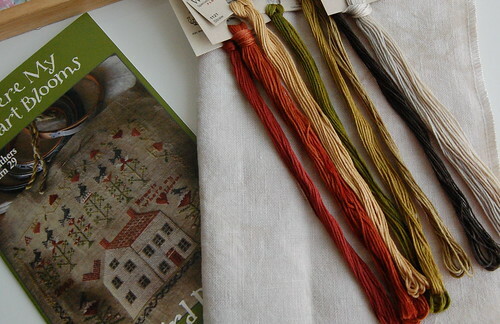 40 ct. Legacy by Picture this Plus, Valdani threads. Another one I have loved since Tanya (Scarlett House) finished it last year is Plantation Sampler (I even asked for her conversion)! 40 ct. Vintage Maritime White by Lakeside Linens, DMC and NPI. And the last sampler I'm thinking of is "Where my Heart Blooms." I've had this one kitted forever too. 32 ct. Legacy by Picture this Plus, GAST and WDW. I vote for Rubie :) Happy Birthday, Nicole. Enjoy your day! I hope your birthday is wraped in miles of smiles, have a funtastic day. You sure do have some serious choices to make LOL I love them all so I am not much help. Happy Birthday! 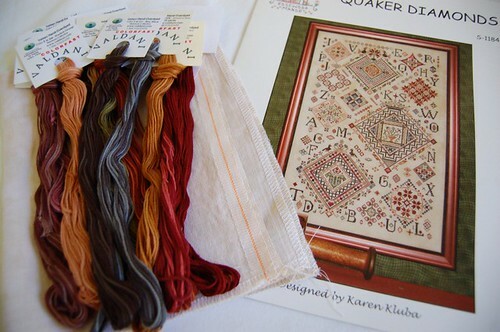 If it's any help I have Where My Heart Blooms a quarter done (and it has not seen the light of day for many moons) and I am just about to start Quaker Diamonds! Happy Birthday. Whatever you decide to stitch have a lovely day. Happy Birthday! I sort of thought Quaker Diamonds sounded good! Enjoy your day. Don't forget that if it's your birthday cake - there are no calories! Have agreat day! Have some fun and eat alot of cake. I would choose Ruby. I vote for the BBD piece.........gorgeous!!! Happy Birthday Nicole! I hope you have a wonderful fun day! I vote for all of them *smile*. Oooh, great choices, all of them! I love the colors in Miss Ruby, but that's all I'll say. :D Happy birthday! You can choose between some beautiful new starts. Enjoy! Happy Birthday Nicole! I hope it's a fantastic day. I love all your possible starts. I have Where My Heart Blooms about 1/2 done. I really need to get back to it but have a couple of ornies to do first. Although all of your potential projects would be lovely, my favourite is still "Where My Heart Blooms"! Happy birthday Nicole! I hope you are having an awesome day. Happy Birthday! Just be happy! wonderful samplers for choice! 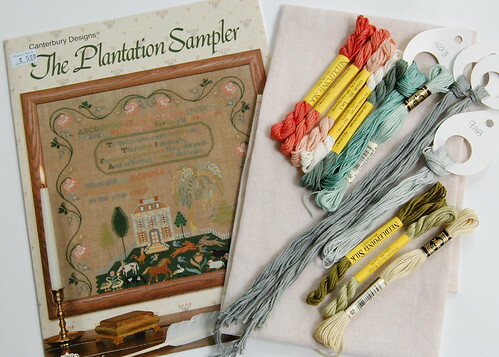 Plantation Sampler would be in first place for me! It's magnificent!! My vote goes out to Rubie!!! "Happy Birthday" I hope you have a wonderful day. Maybe you should start more than one if you're having trouble deciding which one?! Happy B-Day, Nicole !! Boy.. I wouldn't know what to start either... I love them all !! Anything you choose will be great. Enjoy ! Happy birthday! Hope it's been great so far! Tried to connect on Facebook but haven't heard yet. I know you are busy. Hope you have a great birthday though. Those are some beautiful kitted up designs and I just love the Picture this Plus Legacy linen!!!! 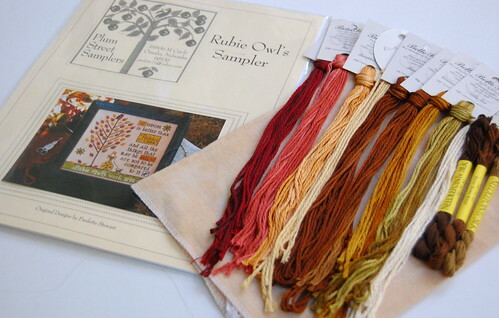 My vote is the Rubie sampler, but i love the plantation sampler. I just read about Tanya redoing it. Tanya it is beautiful. Happy Day, Sweetie!!! What a year of accomplishments for you, Nicole. I'm so proud you're my friend. Can't wait until you move back down here again. I thought you had started Plantation Sampler last year. So, I'm surprised, and I vote that you start that one, absolutely~positively! I have bits of mine done, and maybe I can be inspired to stitch on it again with you. Please send friends to see me there! My Lavender Rose Ramblings blog hasn't been functioning for a while. Hope you had a happy birthday! They are all gorgeous but I think I vote for Plantation Sampler :-). Did you decide which one? That Plantation IS lovely. Quaker Diamonds is slowly rising to the top of my to do stack.